1. I was feeling overwhelmed by the chores I don't have time to accomplish, until I realized I can just leave lists for my teens to complete while I'm at work and the younger kids are with a sitter. It's WONDERFUL. 2. We're so lucky to have friends and family that will watch our kids for free. 3. The only time I have paid a sitter it was my niece who is headed off to college in the fall so I was glad to throw her a bone . . . but she shouldn't get used to it (sorry kid.) Back to the Grandmas they go! 4. My kids have made out like bandits: they've been swimming at the lake and their cousins' pool, they've been to McDonald's and Rita's Italian Ice, they've gone bowling . . . it's been like Camp Grandma 'round these parts. 5. 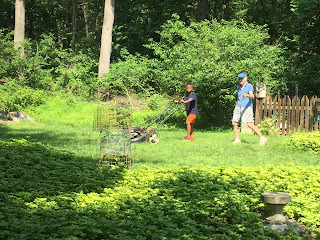 Maybe best of all for my 9-year-old, even better than bowling or french fries or ice cream, he got to fulfill one of his greatest fantasies earlier this week when GRANDMA LET HIM HELP MOW PART OF THE LAWN. All this in just two weeks of summer! So I may feel totally scattered and scrambling to get it all done but I just need to relax, re-read this list and realize we're doing all right.